A woman, her dog, and two secrets that both make her and break her. After Lucy loses everything dear to her, she is caught red-handed in a senseless act that kept her grief at bay. Now, Lucy must share her deepest secrets with a group of misfits each with secrets and something to offer. Think Juno meets Must Love Dogs, for funny and sad characters you won’t soon forget. “I know of few authors who are funnier or more sympathetic than Ann Garvin, and I know of few heroines more in need of comic relief and sympathy than Dr. Lucy Peterman." -Wiley Cash, author of This Dark Road to Mercy and A Land More Kind than Home. Hi Ann! Can you tell us a little about your latest book. 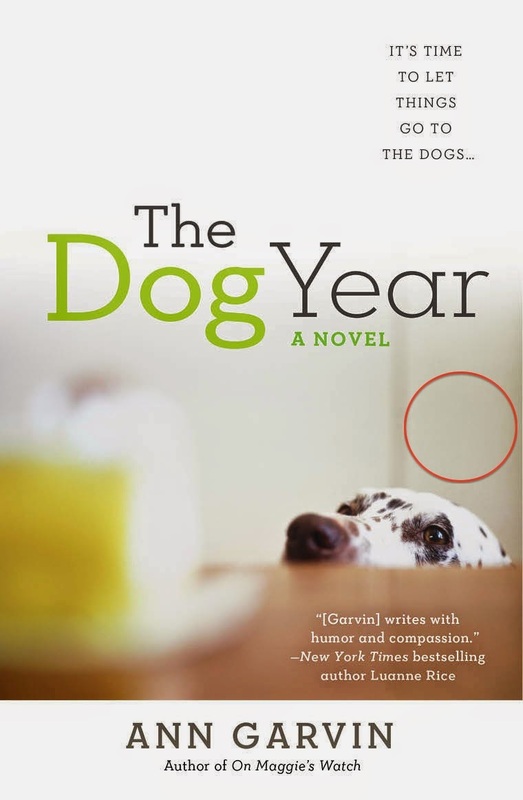 The Dog Year was released this past June (2014) and it's the story of a woman, her dog, and two secrets that both make her and break her. No, but there might a spin off with one of the characters and I don't dare tell you which on. Not until I have a book deal. I've put together a Pinterest dream team. I'm a story teller and I just kind of stumbled into it. I've always been a talker and a writer of letters. I had to learn the process of writing and that took some time (and I'm still learning every day). The more I learn the more I want to evolve and now I feel like it's my life work. “Mother’s Day” by Barbara Holland (Doubleday, 1980) and then re-released as “In Private Life” in 1997 (Akadine Press). Barbara Holland wrote like Erma Bombeck would have written if she were a few snorts into a bottle of scotch. After reading this book, Holland’s sentences spurred me to write my own with a complete range of emotions from funny to sad and back again. My mother passed this book on to me before I became a mother myself. Reading it gave me insight into mothering, my mother and how women deal with the routines of life as they care for their families. “Mother’s Day” exquisitely captures the bitter and sweet of motherhood, and you won’t be sorry if you stack all of her books on your bedside table. People and the human frailty and fantastic humor of everything. Vulnerability. Error, judgement, and empathy. Understanding, surprise, and dogs. Always dogs. At home in front of the wide picture window on a sunny morning at 5 AM when everyone in the house is asleep. Elizabeth Strout, Jane Hamilton, and George Saunders. I'm a really good down hill skier and nobody really knows it. We are like little Norway every May 17th we celebrate Syttende Mai with Norwegian dancing and all things Norway. Ann Garvin is an Easterner who lives in the Midwest and a fiction writer who makes a living as a scientist and educator. While working as a nurse she completed her PhD from the University of Wisconsin-Madison, in exercise psychology publishing extensively in the area of exercise, mental health and media and later became a prize winning short story writer. Decades of teaching health and studying what makes people tick proved a perfect backdrop for her novels ON MAGGIE’S WATCH & THE DOG YEAR (June 2014/Berkley Penguin). Her teaching position as an adjunct in the Masters of Fine Arts position at Southern New Hampshire University allows her to marry her love of people, story and writing and help others do the same. She is a featured writer for www.Unreasonable.is where she writes for entrepreneurs, health, and how to save the world. Ann is devoted to helping people find health, tell their stories and fund raise for wwwgirleffect.org and animal rescues. Ann, a natural storyteller, is a sought after speaker and educator at conferences where writing, health and human nature is discussed.